60 mins: up to Fib PR1, but then what...? Some lethargic revovery which should crawl to Fib PR1 (almost hit it late in the day), but as we have seen recently, the MTFS crossover is indicative of a 'failing recovery' pattern. RUT should therefore not go much higher. 750 has been tested during the course of the day, and could tested again. MTFS and Entropy are again weakening further. We have the final confirmation of the failed recovery pattern mentioned about 2 weeks ago. There are no signs of a recovery (except for the cycle indicator) so RUT should fluctuate within the lower part of the [750-780] trading range. Should volatility increase, the range can be [740-790] . NB: Cycles are the least reliable indicators in our toolset, and can only help determining turning points when all indicators point in the same direction, which is not the case at the moment. weekly: Same trading range [750-875] with lower bias. Caution must be exercised on key level. Swing is down and MTFS and Entropy are certainly not looking too good. One should remain VERY cautious on these levels. A market fall on level breakout is a scenario which cannot be discarded. Swings oscillate a lot on all 3 charts, indicating a key level nearby. MTFS and Entropy indicate congestion to a trading range on this triple witching day. Slight upward bias. Daily: support has been hit but congestion is likely, no excessive optimism just yet. Bar is still red, MTFS and Entropy are not looking fantastic, so we have to wait for the support to be confirmed. MTFS lines being in median territory, there should be any major pressure either way, direction coming from line gradients. Swing is oscillating again indicating we might be close to a key level at this point in time. Caution should therefore be exercised. 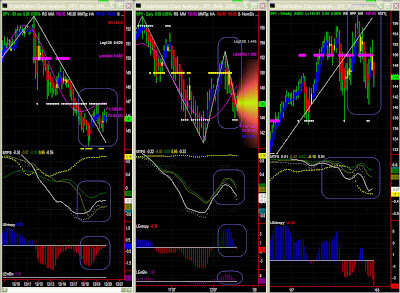 Again, it is more fun on 5 and 10mins time frames. 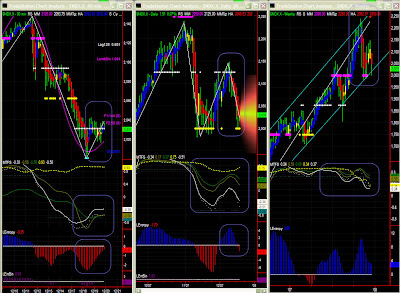 Users of the technique generally select 2 or 3 time frames among 6 to determine the best trading environment. A priori nothing much to expect today but surprises are always possible on witching days. 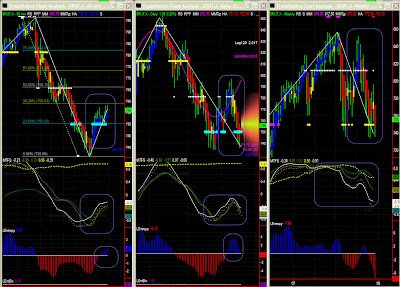 After finding an intraday support at 2016, indicators point for a slight upward bias, aiming at crawling to Fib PR1. We would like to be optimistic after 2000 has been hit, but swing is down, bars are red, MTFS and Entropy have negative gradients, so we'll have to wait a bit. 2000 looks strong enough for now, so congestion is likely. One may also notice an MM octave (i.e. 8 sublevels between 2000 and 2125), so levels will be marked at 2131 and 2162. Not a bad time to take a break and enjoy quality time with the family. There will therefore be no posting in the next 2 weeks unless some exceptional market move warrants it. Please contact me however if you need an update or advice mailed to you.